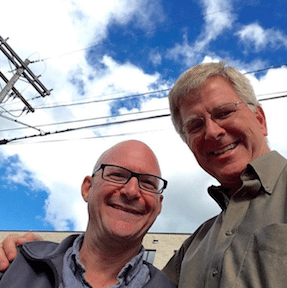 Many months ago, I recorded three different radio interviews with Rick Steves on his radio program, “Travels with Rick Steves.” The third of those interviews, which talks about my forthcoming book, The Ghosts of Bùi Viện Street, is airing this weekend on radio stations throughout North America. Alternatively, you can download the podcast from iTunes (look for episode 520), or find out when and where it will be on the radio. 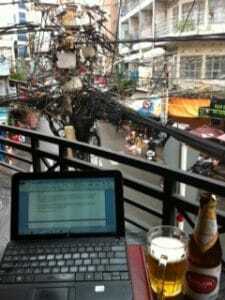 0:40 — Rick says, “[Dave] recommends you check out the lively scene on Bùi Viện Street. And yes! This is true – with one caveat…. Some people love Bùi Viện Street. Others hate it and say you should avoid it. As I explain deeper into the interview, there are both positive and negative things about the street. Bùi Viện Street attracted me in my early visits as a place where I could easily meet local friends. I had my first vacation in Vietnam a decade ago (in fact, the ten year anniversary of that first trip is this Tuesday, April 9) and I still have close friends here who I met on that trip. Why do some people hate it? It’s noisy and chaotic. You will see things that are unsettling — some of which the police have been cracking down on recently. 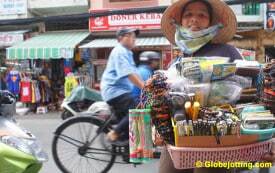 Also, as is the case in many tourist-trodden areas, pickpocketing and petty theft are a popular profession on Bùi Viện Street. Be careful with your wallet and phone! In my book, I am trying to cover the full spectrum of life there, and to help outsiders understand aspects of the neighborhood they are unlikely to understand on a quick visit. 3:10 — I mention street vendors who sell things to tourists. These are people who tourists tend to see as a nuisance and shun. It’s important to understand that many of these people are raising families on the equivalent of three to five US dollars per day. Their sometimes pushy (but at other times friendly, and even downright hilarious) sales pitches become less annoying once you understand that perspective that they are doing what they need to do to get by under challenging economic circumstances. Instead of shunning these vendors, I encourage to consider asking them about their lives. They are often thrilled that someone is taking an interest in them. And yes … it might lead to a secondary sales pitch, but for me, the 45-cent pack of gum I buy in the end is worth it for the perspective they’ve offered me. 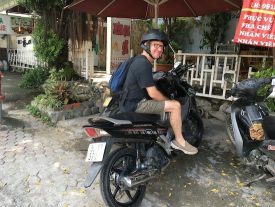 4:40 — We talk about the motorbikes in Saigon. When we recorded the interview, I had not yet learned to ride a motorbike in the city’s insane traffic. Shortly after we spoke, however, I moved to a different neighborhood where I realized I was going to have to learn to drive here … and the thing I never would have believed would happen is that now, driving around the city actually relaxes me. When I’m on my bike, I have to be so focused on what’s happening in my immediate surroundings that I can’t think about anything else. In order to avoid crashing, I must push all other anxieties and distractions out of my head and be fully in the moment. When I’m feeling stressed now, jumping on my motorbike and going for a drive puts me in a happier mood. 5:30 — Rick asks about people I’ve met on Bùi Viện Street. I’ve written about several of them in the article, Saigon Street Stories: Talking to Strangers. 7:20 — I mention Bà Sáu, an elderly woman who has lived on Bùi Viện Street for many decades. I’ve interviewed her twice about her powerful life story. 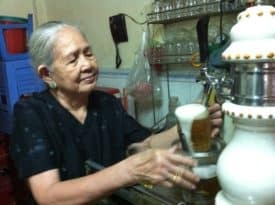 You can read about her here: Bà Sáu’s Bia Hơi: Interview with a Bùi Viện Street Beer Legend. Also, a minor correction: In the interview, I said her name, which translates to “Grandma Six,” refers to the number of children she has. I misspoke. The number actually refers to the order in which she was born, among her siblings. 13:00 — As we wrap up the interview, Rick notes that Bùi Viện Street is now a pedestrian-only zone on weekend nights. The street is now traffic-free from 7 p.m. to 2 a.m. every Saturday and Sunday night. This has been a popular move, and there’s talk of adding Friday nights as well. That’s a positive change I’ve seen since we recorded the interview. On the downside, as the street has become more popular, a new wave of large, glitzy bars has been moving in. Developers are buying up multiple hole-in-the-wall storefronts, and some of the street’s gritty charm is disappearing. This is a tricky thing to complain about as an outsider. Travelers often complain a place should remain “quaint” instead of modernizing. I find that a selfish request. People who live there want better a better economy and modern comforts — and I respect that. I find Bùi Viện Street’s “glamification” unnerving because, as happens in so many places when gentrification occurs, people who have lived there for a long time can no longer afford the rents and are being pushed out. This is my third full-length book. I began it more than four years ago (and expected to finish it in two). It has taken me longer than expected — partly because other freelance projects stalled my work at one point, but also because once I started digging, I discovered this is a more complex and multi-layered story than I had initially realized. I want to get it right and honor the stories of the dozens of people who had shared their stories with me. Rick also mentions my radio program on Expat Radio. You can listen to all of the episodes here.